Pregnant women who will be 35 or older on their due date. Couples who already have a child with a birth defect or have a family history of birth defects. Pregnant women with abnormal results from the California Prenatal Screening Test, a blood test that is usually combined with a special ultrasound in the first trimester to estimate the risk of specific birth defects. Pregnant women who have other concerns about the health of the fetus. While most women in the United States give birth to healthy babies, about three percent have some type of major birth defect. A birth defect can result from a problem with the number or structure of chromosomes and can affect how an infant looks and how the baby's organs function. In most cases, prenatal diagnosis provides the reassurance of a normal result. When an abnormality is diagnosed, this information combined with expert genetic counseling can help women and their partners make important decisions about this and future pregnancies. Preconception and prenatal counseling is available to help you understand your options and make decisions about whether or not to proceed with prenatal testing. The service is provided by skilled and specially trained genetic counselors. 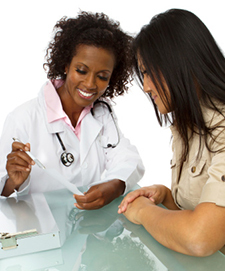 You and your partner may receive counseling whether or not you decide to have prenatal testing.